Some of you may have seen the recent news about the 1,500 year old tree that fell in Sequoia and Kings Canyon National Park in California last month. For those of you who might not have heard about this remarkable event, I thought that I would pop in and share a video link where you can get some more information on the story. The tree itself was one of the largest and the oldest on earth and the pictures of it laying across the ground are stunning. There has been considerable controversy after the fact about just what to do with the tree, which I think makes for an interesting discussion to have with kids. This is especially true since children have such a great way of ignoring all of the obstacles that adults create in thinking about these kinds of challenges! If you are looking for a great companion book for a discussion about giant redwoods, you can check out my review of Redwoods by Jason Chin in the TMG archives here. Ciao and Hello! I am so sorry for the prolonged absence from The Magnifying Glass...traveling back to the States for six weeks and hosting visitors here in Sicily led to a longer than expected hiatus, but we are now "plugged" back in and have lots to share from our recent adventures starting with one of our favorite summer time activities. Summer days in Sicily are hot and dry which means we usually emerge later in the afternoons and evenings to enjoy the cooler breezes and dramatic sunsets. And we aren't the only ones who perk up later in the day: our four o'clock flowers do, too. It is easy to see how they got their common name because their blooms really do unfurl during the cooler parts of the day. It is pretty amazing to see those flowers opening up each afternoon right on schedule. Actually, it isn't an internal clock, but more of a thermometer that prompts them to open up later in the day and close back up again when the temps rise with the morning sun. One of my favorite summer activities as a kid was making flower crowns and bracelets from the four o'clocks that thrived in our yard and it is so much fun to now share that experience with my kids. It's a simple, but very satisfying process. Here's what we do: find a long piece of grass/weed stem, pick a bloom, pinch off the end and pull out the stamen, thread on the grass, and repeat until you have a lovely scented lei. Four O'clocks (Mirabilis jalapa) are tropical and nocturnal plants which means they grow best in warmer climates and they open at dusk. Their enticing scent attracts hawk moths and sphinx moths. The seeds are also fun and easy to collect especially for eager little hands...just be sure no one eats them or decides to stick one up a nostril (like my mother did when she was a child...she didn't tell anyone until it began to swell and germinate). In warmer climates the four o'clocks will usually re-seed and multiply for future summers, but in cooler areas save the seeds for planting next spring or dig up the tubers that are formed and store those in a safe spot for re-planting in the spring (similar to what is done with dahlias). I hope you and your families are enjoying this summer season (or winter if you are in the Southern hemisphere). Have been growing anything fun, interesting, or tasty in your yard this season? If so, please tell us about it! Today my son came to me with a sunflower leaf (from his sisters butterfly garden... shhhh) and told me that it was rough like sandpaper. We started talking about texture and all the different textures we find in nature. That sparked a texture walk. Since this one started with a leaf our walk had a leaf theme but it just as well could have been dirt, rocks, tree bark or all of the above. His favorite... the soft and fuzzy mint leaves. But I think that is because he likes to nip a little taste while he is out to play, as evidence by the state of the mint leaves. There are advantages to ending your texture walk in the herb garden. ~ Talk with your kids about texture and make a list of different textures before you head outside to find the textures on your list. ~ Choose a theme, like our leaf theme, and see how many different textures you can find within the theme. ~ Place some nature items in a bag then have the kids reach in to feel them and give a guess based on what they feel. Talk about how the texture helped them figure it out. ~ You could also do a color walk or a shape walk. Do you have any other ideas for themed nature walks? We would love to hear about your walk. I would venture to say that most people would visualize a knot this way. At some point along my journey I learned that knots formed where branches were attached to the tree. Once my kids started asking questions about the strange circles in the wood on the shed I passed on my knowledge. But a flat board makes a somewhat abstract representation of a tree. One day this last fall I was splitting wood and found some interesting knots. They split apart and went right back together like a puzzle. I called the kids over and they had a great time fitting the pieces together and looking at the bark side to see where the branch would have come out of the tree had it still been attached. We talked about how trees grow and how the branch extended deep within the trunk of the tree to hold it in place. Now that spring is here we are finding new growth all around. The kids are looking at how new growth starts out and the structure of the trees in a new light. As I was looking back at some old pictures I realized that we have been looking at trees for a long time. 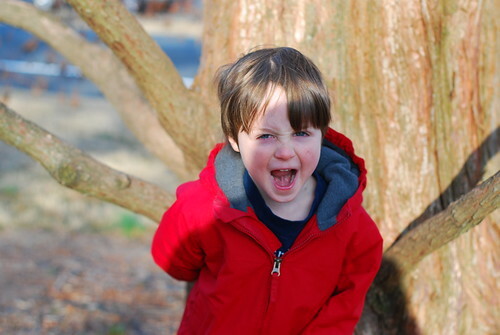 This picture of my son looking up at the small oak tree in our backyard is from two years ago. This brings home the idea that with each passing year, with each season that goes by, they are adding new layers of knowledge about the natural world. Their understanding of how things work is branching out and taking root, building upon each experience, like new branches build upon the old growth. Next month I am taking the kids to visit my parents in Colorado. My dad has plans to build some wonderful wooden toys with them. They are excited and I am sure will come away with another layer of knowledge about wood and trees from the woodworkers perspective, just as I had as a child. Are there any nature topics your family comes back to again and again, building knowledge with each visit? We would love to hear about them. As spring approaches our thoughts turn toward the garden. Last week we were out marking off locations for our new garden beds... the kids staking out areas for their butterfly and hummingbird gardens. The garden notebook has come out to assist in making a map filled with the new vegetable beds, a pea tee pee, a sunflower house and a pumpkin patch, of course. We still have a good icy layer of snow on the ground. Most folks around these parts don't put the garden in until June 1st. With such a short growing season, and such a long time to wait until we can truely put in the garden, it is essential and fun to get a head start on things inside. One of our favorite ways to get that head start is to start seedlings in egg shells. We start by washing the egg shells and storing them in a safe place until they are needed and we have enough for our project. When the timing is right (depending on your growing season) simply fill the egg shells with soil, plant your seeds, keep moist and watch for your seedlings. Sometimes we keep them in egg cartons to help them stay upright and organized. When it is time to transplant them simply break the bottom of the eggshell and place everything in the pot or garden bed. We have some time before we will start this project but, for those of you in warmer places, we would love to see some pictures of your seedlings in the TMG flickr pool. Have you started any spring garden projects? We would love to hear about them. Join us next week for another Thursday post on our Microbe Biosphere make-along project. Our family lives in a rather crowded area just outside of a large city. We’re lucky to have lots of green parks and bits of woodland, but as you might imagine, it’s mostly yards and planted gardens around here. As a result, many of the plants we see around us aren’t native or ‘wild’—they’re ornamentals planted as landscaping. Some nature-lovers might find that rather . . . humdrum, but if you keep your eyes wide open, little surprises do pop up. This is a Dawn Redwood. For a number of years, scientists were quite familiar with this tree, but only as a fossil. So many of these fossils had been found, together with dinosaur bones, in what is now California, that they decided the trees had once grown in large forests with dinosaurs like T. Rex roaming around. All of these tree fossils were quite old, and to the scientists, that could only mean one thing: the Dawn Redwood died out and became extinct long ago, just like the dinosaurs. Then, in the 1940’s, groups of this tree were found in China, and the tree was declared a “living fossil.” Although this tree managed to survive from the time of the dinosaurs until today, the tree is still endangered; only about 5,000 to 10,000 of these trees grow in the wild. The Dawn Redwood is a close relative of the Giant Sequoias that famously grow on the West Coast of the United States. Like the Giant Sequoia, the Dawn Redwood is a conifer; they both produce cones, like a pine tree. However, the Dawn Redwood is a bit different from the vast majority of conifers, because it’s deciduous, which means that its leaves—or more accurately, needles—turn brown and fall off in autumn and winter. They re-grow bright and green in the spring and summer. The Dawn Redwood produces two kinds of cones. The "female cones" were pictured previously. 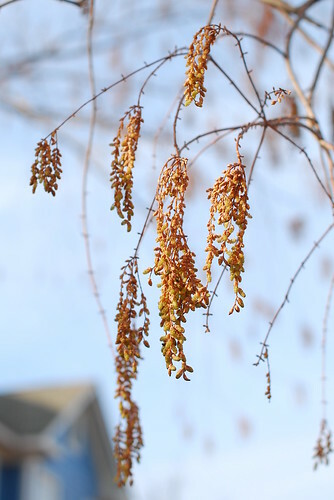 It also produces male “cones,” that hang in fronds from the tree during winter and early spring. From a distance, these “cones” look like leaves, but during winter, the tree’s needles can only be found on the ground. Once you’ve spotted a Dawn Redwood, you’ll always recognize it, because it’s so distinct from most other trees. It grows quite tall, and its shape is highly symmetrical. When you stand under its branches, you can easily imagine you are back in the age of the dinosaurs, and that there’s a T. Rex stalking you. T. Rex? Also not as extinct as you might have thought. Read more about the Dawn Redwood here. Also, check your library for the book, Discovered Alive: The Story of the Chinese Redwood. There are quite a few Dawn Redwoods planted in California, but another great place to see Dawn Redwoods is New York City. There might even be one in a park near you. This is our third winter in what you could actually call the seasons. While living in southern California as the seasons changed we would talk about the subtle changes in the light, the changes in temperature... of a few degrees... or the lack of tourists at the beach. Since moving to Nova Scotia we have truly experienced the seasons and all the wonderful transitions they have to offer. Of all of these transitions the one from winter to spring is the only one I wish to push along a little bit. I have a feeling I am not alone in this desire to push spring. We still have a good deal of winter ahead of us here and we usually save this project until our spring is a little closer but this weekend we could not resist. We went out to collect some budding branches for a little spring preview. It is good to take samples from hardwood trees. We cut maple, cherry, lilac and apple. Be sure to ask permission if you would like to collect from trees that belong to others. We took some pictures to remember what they looked like when we started. This would also a great time to encourage your young naturalist to draw some pictures in their nature journal. We are going to draw ours this week. We placed the stems in vases and found a nice light spot to watch them. It is good to get them into water as quickly as possible before the ends seal up. You can also make a fresh diagonal cut once you are indoors and ready to place them into the prepared vase. In years past it has been very exciting to see them open. With all of the snow we have on the ground right now we are really looking forward to this spring preview. Have you had any signs of spring in your area? We would love to hear about them. I almost hesitate to post this gift idea here since it is so simple, but it really is one of my favorite gifts to give (and receive) and we seem to have made a tradition of it in our family. Some years we give blooming bulbs, other years seeds or small pots of fragrant herbs. Some years we decorate the pots (by painting or decoupaging), other years we have just wrapped them with pretty tissue paper and bows. These living gifts of green are perfect for teachers, neighbors, and garden-loving friends. They are also gifts that little hands of all ages can easily help to prepare. And these are gifts that will hopefully provide some much needed color and cheer during the chilly months of winter. This year our gifts of green are succulents. Since moving to a Mediterranean climate, we have discovered the wonderful world of succulents. They come in a wide variety of shapes, sizes, and textures. They don't need much water and they can thrive in sun and shade. And best of all, they multiply like crazy! Seriously, all you really need to do is break off bits and pieces, let them dry out for a day or two, and then just stick them straight into the dirt where you want them to grow. Be sure to include the name of the plants you are gifting along with care instructions. And if you really want make those teachers/neighbors/gardening friends happy, try making some of this fabulous gardener's hand scrub to go along with those special green gifts. Happy planting and happy gifting! 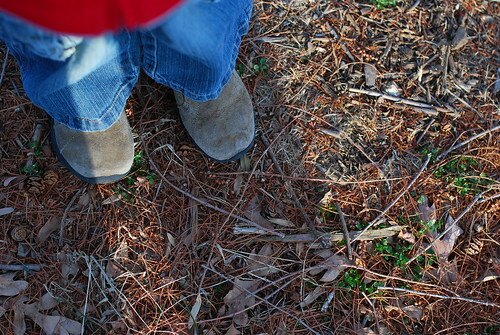 This weekend I got to spend some wonderful time with my little boy looking at trees. I love it when I get one-on-one time with my little ones and spending that time in nature is icing on the cake of life. After spending the rainy morning inside doing all matter of crafts, games and reading we finally got our chance to get out. And we took it! He loves trees and we headed straight up to the oak forest behind our house. We were looking at the bark and started talking about how we can tell the age of a tree. We have talked about counting rings before but not about how to tell the age of trees that are still alive. As we observed the different oaks we started talking more about the bark. He noticed that the big trees had rough bark. We took a closer look and saw that as the trees got bigger their bark changed too. A smaller oak is like a little kid oak, an oak bigger than that one is like the Mama oak, bigger still would be the Grandma oak and the biggest oak in the forest the Great Grandma oak. It made total sense to him and I loved that we made a "family tree." Not only were they growing bigger as we moved along our “oak family tree” but we noted that as oaks age their bark gets rougher and rougher. Then he remembered that on another hike we had seen some really tiny oaks down the hillside on the other side of the meadow. Off he went in search of them. He found them and discovered that they had very smooth and green bark much different from the bigger oaks. We examined the buds already formed, waiting for next spring. We talked about how all the trees we had seen started out just like this little baby tree, which started from a tiny acorn. He was excited to find more “tree families” and we were off. We looked at maples and the tall cottonwoods. It was a beautiful time to spend with my little man observing the life around us. Life that was here before we were born and may just be here long after we are gone. What a gift to share this place with them. This is a great time to observe trees. With many of them almost leafless it was neat to focus on their bark and structure. It was fun to see him stand tall at the base of those straight birch trees looking up, getting a true sense of their height. The next day we read Trees, Leaves and Roots. Like the other Fun with Nature Take Along Guides it was a great introduction to what we saw. With about 600 species of oak in the world we think we narrowed ours down to red oak with the help of our tree guide. If you like to draw or have an older child around who would be interested in learning more about drawing trees the book How to Draw Trees by Henry C. Pitz is wonderful. Once this crazy rain stops and the trees get a chance to dry out we are going to do some bark rubbings. We want to make a "Book of Bark" with our rubbings not just identifying the trees but also the families of trees with their changing bark. What have you been out and about observing in nature this fall?